Collaboration project with Good Enough Subs! On the 8th season of NOGIBINGO!, the main focus of the show will be to bring us closer to Nogizaka's 3rd generation. 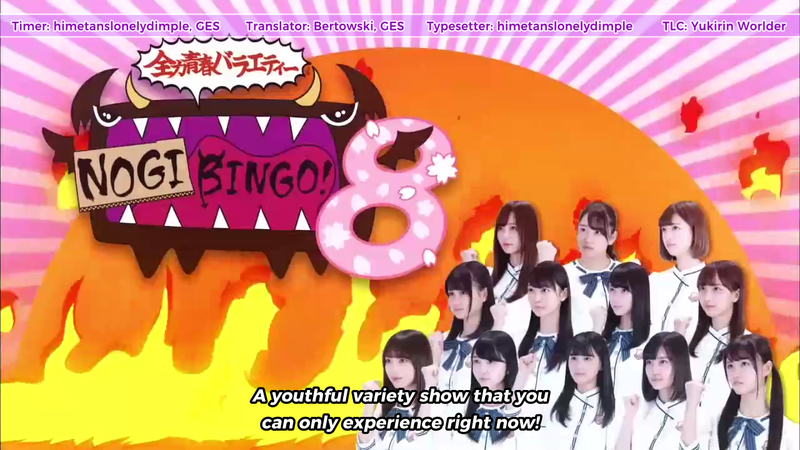 On this first episode, we will be introduced to the 3rd gen girls, and they will be taught the ropes of variety by senior 1st Generation members: Ikoma Rina and Akimoto Manatsu! Thanks a lot!!! Very much appreciated.. Were discussing it amongst the team, and we honestly have no idea what to make about this since everyone is getting different results. Where exactly are you having the problem? Because all of us can play and watch the video with the file just fine, but when it comes to opening the file in Aegisub, the program crashes for some. And it is the first line (the logo) that seems to be causing the problem. But again, it's only occurring to SOME of us, but ONLY when opening the file in Aegisub. Thanks for the subs !